Where Is Mold Lurking In My Home? The core service that First Call NY specializes in is mold removal. We are experts at mold removal and proudly serve Poughkeepsie, Hopewell Junction, Newburgh and all nearby counties. 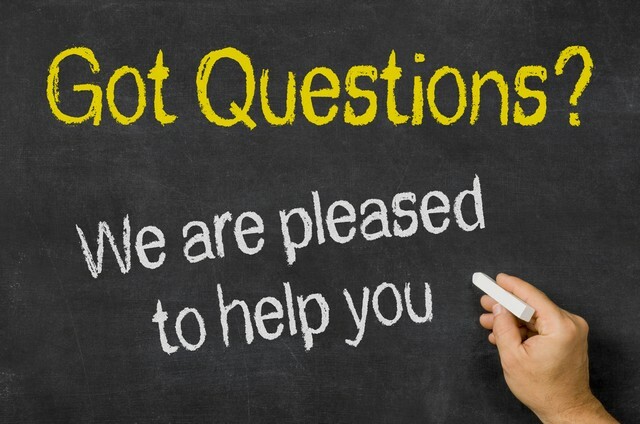 Typically, we are called in when a home or business owner suspects that they have mold. Renovating? Be Aware Of Mold and Asbestos! Continuing on with our mission of educating you, the purpose of this article is to help you determine if you have a mold problem by identifying the top 7 areas in your home that you will likely find mold and explain what you should NOT DO if you do find mold! Top 7 Places You Will Find Mold In Your Home! You can not avoid mold. In fact, mold spores are everywhere. The reason that you do not see piles of dead plant material and other organic material accumulating outside is because of mold. Mold has a purpose in our eco-system, to feed on dead organic matter. The core problem with mold, however, is when it begins growing indoors. When this happens, the indoor spore counts increase to unhealthy levels and this is what leads to sickness. Unfortunately, most homes are filled with food that mold loves to eat: paper, wood, drywall, wallpaper, carpet, ceiling tiles, dust, and dirt. The other ingredient that mold needs to thrive is the right temperature ranging from 41 degrees to 100.4 degrees Fahrenheit, common in our service area. The final and most important ingredient mold needs is moisture. Mold can not grow without moisture. In the Poughkeepsie, Hopewell Junction, and Newburgh areas, the biggest challenge for home owners is keeping moisture down because of the high humidity levels caused by higher temperatures. Humidity control is essential to mold control. Other sources of moisture could be caused by leaking pipes, roofs, environmental events like floods, sewer backups, and of course human error, like forgetting to turn off the water in your bathtub. Mold prevention is based on moisture prevention. 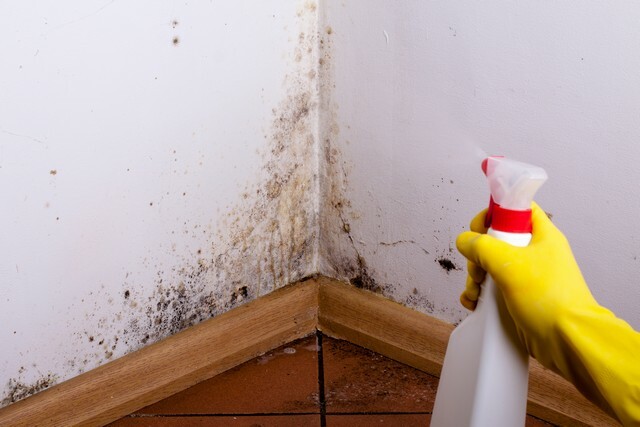 One of the most common signs that you may have mold could be a “musty” or “mildewy” odor. In addition, your home may provide you with visual clues that you have mold which could include buckled floorboards, carpet that is discolored, water stains on ceilings or walls, and of course visual growth. Keep in mind, not all mold is black, but can be various colors. Bathrooms and Kitchens. 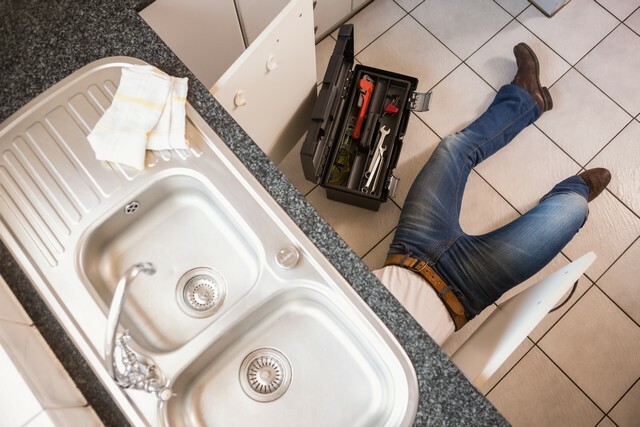 Leaks are the common cause, meaning you should look under the sinks. If you find a leak, get it fixed. Appliances. Your refrigerator, dishwasher, and washing machine are another potential leak source. Check behind and under the appliances for mold. Roof/Attic. If you notice water stains on the ceilings, then your roof could be leaking which will cause mold if the leak is not repaired. Windows. If you have condensation in the home, you will likely find mold on the window sills and around the windows. Basement. If there is high humidity in your home, then check your basement and other areas of the home for mold. Closets. Leaky pipes, high humidity, and other sources of moisture can result in hidden mold in your closets. If there are boxes in the closet, move them and check the walls and floor for mold. Crawlspaces. Moisture in your crawl space will cause mold to grow. 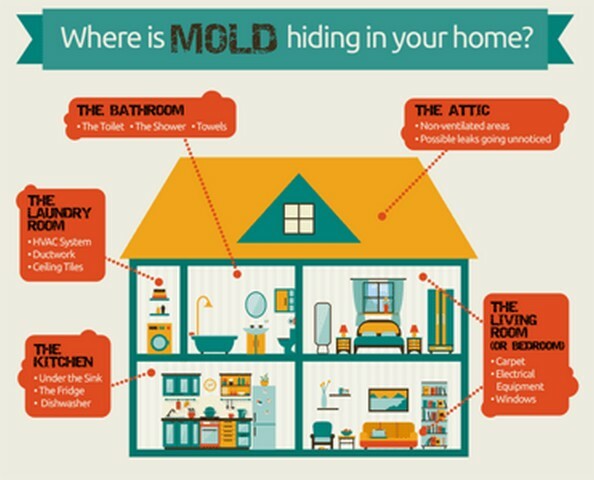 If you find mold or suspect you have mold it is very important that YOU DO NOT DISTURB THE MOLD for two key reasons. Spores Are Released By Mold! A common instinct of most people if they find mold is to begin the clean up process immediately. However, this is not recommended because mold proliferates by releasing spores. Disturbing an area of mold growth can actually worsen the mold problem in your home because more spores will be released. The goal of mold removal is to prevent spores from spreading throughout the home by ensuring that it is contained. Mold Is Linked To Health Problems! As our previous article explained, mold can make you sick. In fact, even a little mold in your home or business can cause sickness because some mold species, including Aspergillus and Stachybotrys release mycotoxins that can depress the immune system. DO NOT Take These 5 Actions If You Find Mold! DO NOT Remove Mold Contaminated Materials Without Proper Containment! Mold remediation professionals set up containment barriers to prevent mold from spreading. DO NOT Clean Mold With a Normal Vacuum! Mold spores are extremely small and pass through a normal vacuum filter. Vacuuming simply spreads the spores, and you want to avoid this! Mold remediation professionals use HEPA vacuums because the filters trap the mold spores preventing cross contamination. DO NOT Try To Kill The Mold With Bleach! The internet has lots of information that states you can kill mold with bleach. Bleach is great for cleaning bacteria and viruses, but is not a long term mold removal solution. Attempts to kill mold with bleach and other chemicals can cause more harm than good because they are not very effective and also dead mold spores can be just as harmful to the health. Reputable restoration companies will never recommend the use of bleach because they know that it has no impact on porous materials and is unable to penetrate the surface and kill the roots of mold. DO NOT Remove Mold Contaminated Materials Without Wearing Personal Protective Equipment! Mold remediation professionals wear safety equipment to prevent mold spores from entering the lungs and touching their skin. DO NOT Ignore Your Mold Issue! There are two essential reasons why you should not ignore your mold issue. First, mold growth can negatively impact your health! Second, mold is like a parasite that will continue to feed on your property as long as the right conditions exist. Constant feeding by mold will impact the structural integrity of your property, reducing its value. If you have mold, the most important step is to fix the moisture source! If you find mold in your home or business, just remember that disturbing the mold can make the situation worse. Contact First Call NY by sending us an e-mail or call our mold hotline, (845) 226-0868.